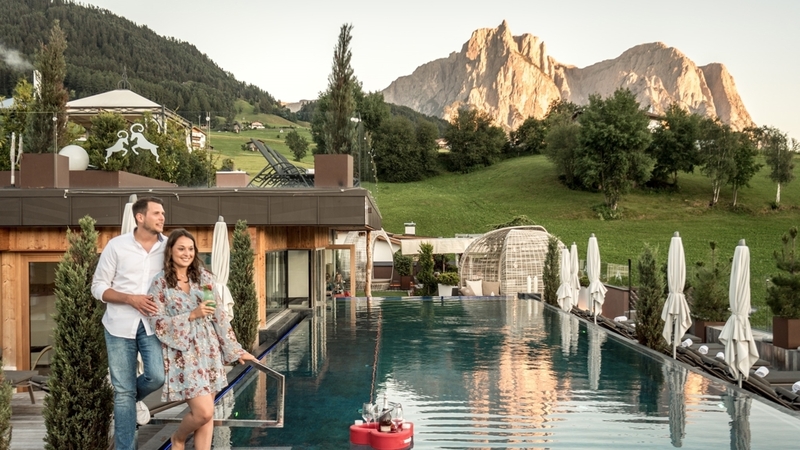 Wellness in the heart of the Dolomites and in the centre of Kastelruth. Organic natural wood room and suites; large garden - roof garden terrace with panoramic sky pool. 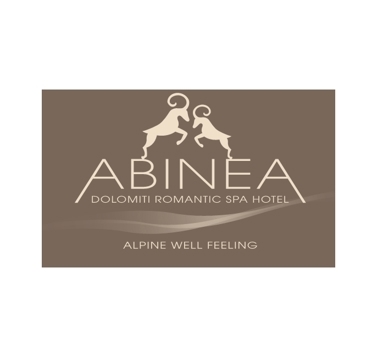 Abinea Dolomiti Romantic Hotel SPA **** is an elegant four-star hotel in Kastelruth, surrounded by the legendary Mt. Schlern on Seiser Alm pasture, only 150 meters from the village centre. If you are looking for a maximum comfort holiday in a unique natural environment, our hotel is sure to be the right choice! Our hotel is tastefully furnished in a modern and alpine style. The decor of our suites and rooms is in natural wood, eco-friendly materials such as stones and wood. All rooms have a balcony or terrace, large panoramic windows with electric roller blinds, relax sofa, ample closet space, safe (included), Internet access (LAN), telephone, flat-screen TV and radio. In every room, at your arrival, you will find a wellness bag with a bathrobe, towel and slippers provided free of charge for the entire stay. In the very spacious bathrooms, you will find a large shower, heated floor, heated towel rail, hair dryer and complimentary toiletries. One of the strengths of our hotel is without a doubt our new wellness area. It includes a panoramic sky pool and whirlpool on the rooftop terrace, sauna and relaxation area with hay sauna, herbal sauna, Turkish bath with rock crystal, Kneipp, cold room with ice fountain, wellness showers, relaxation area "Stille Alm" with hay beds, sitting area with fireplace, beds and romantic corners. To complete the offer, the excellent dishes prepared by our Chef with international experience, who creates delicacies with fresh local products. In our lounge, you can enjoy relaxing moments with your loved ones. Comfort 20 m² (2 pers. )- with balcony, desk, plasma-sat-tv with radio channel, phone, fridge, internet connection, safe and a bathroom with beauty mirrow, shower, toilet, bidet and hair-dryer. Romantic 30 m² (2 - 4 pers.) new, spacious room with balcony, natural wood furniture, romantic illumination, wood loft, internet connection, fridge, safe free of charge, flatscreen TV with national and international stations and radio transmitter, telephone, comfortable relax-sofa, desk and modern bathroom with underfloor heating, make-up mirror, shower, Wc, bidet, towel warmer and hairdryer. You need a time out? Discover a great Unesco World Heritage with a free holiday night for you and your children! Descover the World Heritage Dolomites with your kids; for children until 15 years are charged only EUR 350 per week no matter what room typ. Spring in the Dolomites and Alpe di Siusi. Wellness & -SPA Hotel in the dolomites. During the hiking weeks in ABINEA we bring you to the most beautiful spots of the Sciliar area. Celebrate a carefree Christmas with us without any stress and enjoy the special and cozy atmosphere in our house, in the middle of the silent mountains. For our honeymooners. You will get 1 hour in our privat SPA for free! A fun ski day for FREE: this means sun-skiing with one day free of charge: 7 days accommodation at the price of 6 with halfboard PLUS treatment and all the Abineas inclusiv services. Abinea's winter gift: From the 6th to the 23th December 2018 our guests will get a free vacation-day for stays of 4 days or more and 2 days for stays of 8 nights or more. Offer Holiday in the dolomites Admire the flowers spell on the Seiser Alm! Innumerable, also rare alpine flowers transform the high meadows in a magic carpet colors. Babysitting , Vegetarian food , Home made products, Dietary food, Food for people with food allergies, Light diet, Diabetic food, Bike rental, Gratis Skibus, Sunshade, Deckchair, Ski depot in the house, Ski depot outside the house, Ski rental, Hiking Guide, Live-Music, Journals at disposal, Multilingual receptionists by day, Shuttle service (train station, airport), Baggage porter, Video surveillance, Pets allowed, laundry service, Snow boot dryer, Shoe shine machine, Room service, Shuttle service, Environment award, Dog-friendly accommodation, Bike deposit, Children's meals, Packed lunches, Breakfast in the room, Secured storage spaces for bikes and motorbikes, Pool/beach towels, Baggage storage, Int he village centre, Shops in the environs, above 1000 m a.s.l.